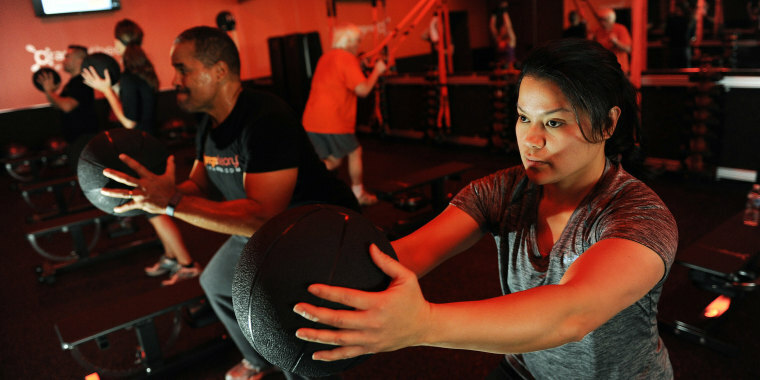 Orangetheory Fitness is one of the hottest fitness trends out there right now. So what's the workout all about? Orange is a color most associate with the citrus fruit or Halloween. But for the 623,000 people nationwide who are members of Orangetheory Fitness, it’s the color of their fitness obsession. You might have spotted an Orangetheory Fitness gym near you or noticed friends posting about "Orangetheory nation" or "OTF life." The studios are drenched in the bright, vibrant color and seem to be everywhere these days. The first studio opened in Fort Lauderdale, Florida, in 2010, and since then, they've expanded to over 900 studios. So what’s all the health obsession all about? The one-hour work out is the brainchild of physiologist and Orangetheory co-founder Ellen Latham, who developed the “Ultimate Workout,” which has helped people push through their fitness plateaus. 1. It’s based on your individual effort. Unlike other classes, the workout isn't about how many pushups you can do or your mile time, but how hard you work. Instead of having everyone in a class do the same thing, members do variations of the same workout wearing heart-rate monitors to capture how hard their body is working. A person’s heart rate number is then measured against a range, based on age, to create what Orangetheory calls your “splat number,” or your level of effort. The numbers are displayed on the board, where members are encouraged to hit the “orange” zone of high effort. “We want you to hit your own goals and reward your own efforts based on what you did in class,” said Michael Piermarini, Orangetheory’s director of fitness. 2. The workout is the same at every location, and changes daily. While the workout follows an outline format each day using the rowing machine, treadmill and gym floor, one workout is never the exact same as the day before. A group of about five certified trainers design more than 90 exercises each month that focus on different muscle groups. Then the workouts are tested in house with members, approved and then rolled out to the greater “orange” public. Latham designed the workout format to include people of every fitness level, adding that being inclusive is one of the things that makes her workout different. "I knew that I needed non-impact way of putting wattage into the workout, and that jumping on high boxes would not be ideal for people with knee issues," she told Today.com. "So I incorporated water rowers (...) for the treadmill portion, we have speed walkers, joggers, runners ... we have every level." She's received so many positive stories from clients who've used her workout at Orangetheory, that she's started posting them online. There are different levels of membership: basic (four classes for $59/month), elite (eight classes for $99/month) and premier (unlimited classes for $159/month). However, cost can vary based on location, so call your nearby gym. Orangetheory hopes to create a community with their uniform workouts and challenging, but friendly coaches. For over half a million people, it's working. "The support from the fellow oranges and coaches/staff is something that is almost impossible to put into words ... It’s the non-scale victories that have been even more rewarding," wrote one member, Carissa C., who added that she originally intended to only be a member for a few months. “We want you to come in and have the community feel that sets Orangetheory apart,” Piermarini said. If you're interested in starting a fitness journey, sign up for our Start TODAY newsletter.